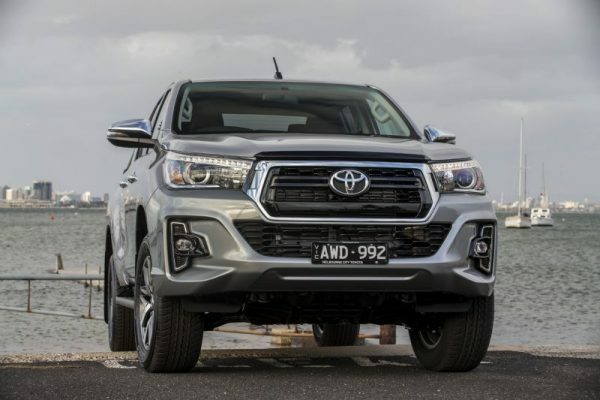 Toyota has updated selected HiLux SR and SR5 models with a new front end styled by Toyota’s Australian design team based in Port Melbourne. The bold new face for all SR and SR5 extra cab and double cab models mirrors that found on the top-end HiLux Rogue model that was launched earlier this year. 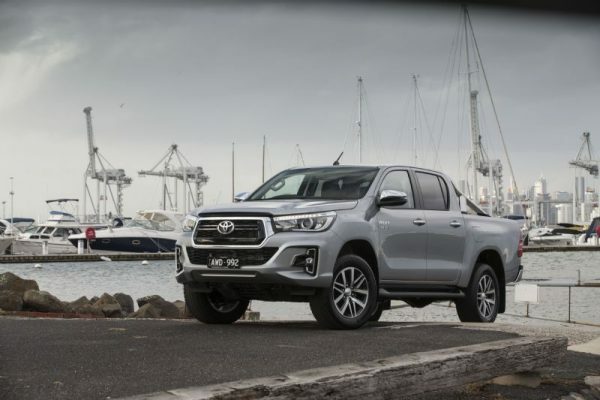 Toyota Australia’s vice president sales and marketing Sean Hanley said the fact that the same face now adorns HiLux SR and SR5 models sold in Australia, and the equivalent Thai models, was a testament to the talent of the Port Melbourne team. “When we styled the Rogue, we knew it was the right design for the growing top-end recreational ute market and our faith in that has now been borne out with the same face adopted on SR and SR5 HiLux models,” Mr Hanley said. The redesigned front end features a stronger, more vertical profile with its large trapezoidal grille, honeycomb insert and outboard fog lamps giving it a broad stance and imposing presence on the road. The grille and fog lamp bezels are finished with a chrome treatment providing a refined aesthetic with the SR5 models featuring LED headlights and fog lamps and the SR models gaining halogen fog lamps to match its headlights. In addition to the new front-end styling for selected SR and SR5 models, improvements to efficiency have resulted in most six-speed automatic models offering a slightly reduced fuel consumption. Combined fuel consumption for 4×2 SR and SR5 automatic models has been cut by 0.2l/100km to 7.9l/100km with a corresponding fall in CO2 emissions to 209g/km*. Automatic SR and SR5 4×4 models gain a 0.1l/100km improvement with combined fuel consumption falling to 8.4l/100m and CO2 emissions to 220g/km. All diesel HiLux models – both 2.8-litre and 2.4-litre – now also feature a Diesel Particulate Filter switch to manually initiate a “burn” to cleanse the system and reduce harmful emissions. The diesel particulate filter (DPF) works by capturing fine particles before they are emitted through the exhaust and regularly burning them off at extremely high temperatures. Under normal operating conditions, this is controlled by the engine’s electronic control unit (ECU) and automatically happens without any input needed from the driver. But in rare cases if the vehicle is not driven long enough at high speeds to enable this, the filter becomes overloaded. A warning is then given to the driver who can now use the manual DPF switch to initiate the cleansing of the system and ensure its efficient operation. A DPF switch has also been fitted to all Toyota Fortuner SUV models that are based on the HiLux architecture and feature the same 2.8-litre turbo diesel engine. While the updated models offer bold, contemporary and more upmarket styling, prices have not gone upmarket. Apart from a minor $80 increase for 4×2 Hi-Rider SR models and 4×4 SR extra cab chassis and SR double cab chassis and pickup models, Toyota has maintained pricing on all other HiLux models. The stylish 4×2 SR Hi-Rider six-speed manual pickup starts at $39,990# and features Toyota’s proven punchy 130kW 2.8-litre turbodiesel engine and plenty of creature comforts including air conditioning, premium fabric seats, and a large 7-inch infotainment touchscreen display. The 4×2 SR Hi-Rider pickup models are also available with a smooth shifting six-speed automatic transmission with the extra cab priced from $40,990# and double cab priced from $41,990#. The premium auto-only $49,940 4×2 SR5 Hi-Rider double cab also features climate control, satellite navigation and 18-inch alloys and a stainless steel sports bar that complement its newly minted stylish front end. The updated 4×4 SR models are now priced from $42,990# for the extra cab chassis manual and $45,140# for the double cab chassis manual with the automatic transmission adding $2,000. Pickup versions of the double cab SR command only a $1,500 premium. Stepping up to the higher-spec 4×4 SR5 models, prices remain unchanged with the automatic-only extra cab and manual double cab pickups priced from $54,440#, and the automatic transmission adding $2,000 to the price of the SR5 double cab pickup. 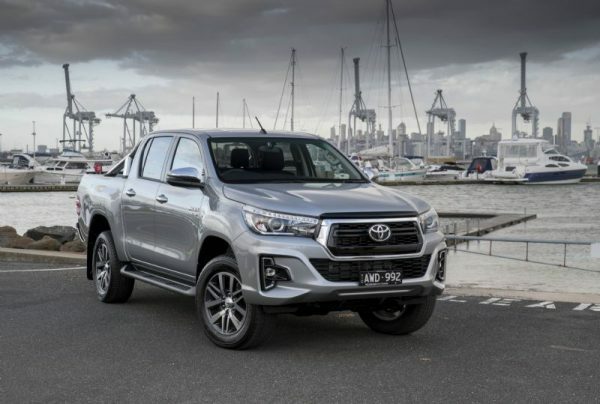 With the new contemporary front end, expansive model range and unbreakable reputation, the updated HiLux models will continue to help ensure HiLux remains Australia’s best selling vehicle.